The successor to last year’s red-hot Motorola Droid X is set to arrive with a dual-core processor and a sharper display, but those hoping for a dose of speedy LTE data access should prepare for disappointment. Slated to land in Verizon Wireless’ smartphone lineup on May 26 for $199 with a two-year service agreement, the Droid X2 comes with the same jumbo-size display as its predecessor: 4.3 inches, to be exact, although its 960 by 540-pixel resolution crams in about 26 percent more pixels than the original’s display. And yes, the handset itself is still pretty bulky: think 5 by 2.6 inches, although its 0.39-inch girth is still reasonably thin. Also more-or-less the same: the X2’s eight-megapixel camera (which comes with a dual-LED flash, auto-focus, and 720p HD video recording) and mobile hotspot capabilities (good for sharing 3G data with up to five nearby Wi-Fi devices). So, anything else to see here? Well, besides the X2’s sharper display, we’ve also got a new HDMI-enabled “Mirror Mode,” good for playing slide shows, videos, and movies stored on the Droid X2 on any HDMI-equipped TV. Not bad, but the bigger news lies under the X2’s hood: a dual-core 1GHz processor, which Moto claims is twice as fast as the processor in the Droid X. 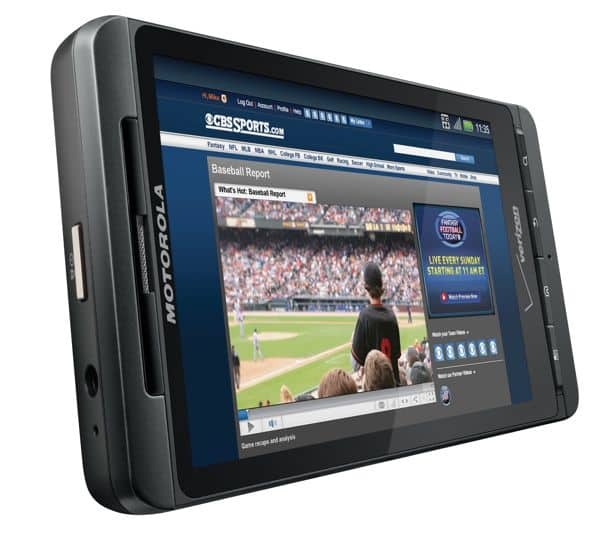 Sadly, the main improvement that power users were likely hoping for in the Droid X2—compatibility with Verizon’s speedy new LTE data network—is missing in action, somewhat surprising given the Droid X’s elite status among its Android-powered competitors last year.